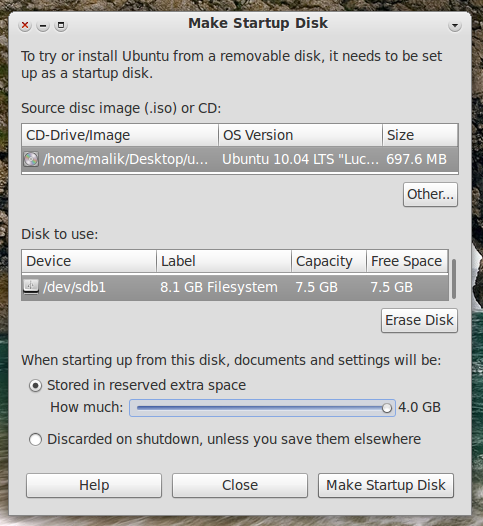 A persistent bootable USB drive can be used to boot and install Ubuntu on any PC capable of booting USB drives and at the same time, it can save nearly all the changes you make between reboots including software installation, updates, etc. However, it doesn't seem to support Kernel updates till now. Startup Disk Creator is included by default in Ubuntu (and most of its variants). In classic Gnome, you can find it under System > Administration menu or in Unity, you can search the Dash for 'Startup Disk Creator'. A USB flash drive: You can use 1 GB drives for persistency but there will be only 300 MB of space to be used by persistent file which is pretty low. We recommend using a 2 GB drive at least. At the maximum, you can have a persistent file of 4 GB. Access to a PC running Ubuntu, or a bootable Ubuntu LiveCD and a PC with a working CD-ROM drive. Of course, you can also boot a PC from an Ubuntu LiveUSB (persistent/non-persistent) if you already have one. 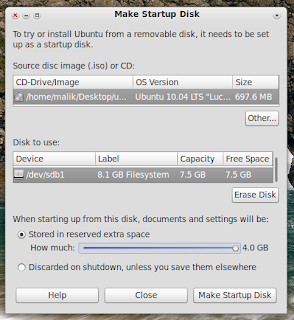 Open up Startup Disk Creator from System > Administration menu or by searching the Dash in Unity (whichever applicable). Click the 'Other...' button and set the path to your downloaded image. Click 'Erase Disk' if you want to format the USB drive. Remember, it would delete all the data on the drive. Or if it was already formatted properly, scroll down in the 'Disk to use:' box and choose the intended partition where all the data would be stored. We recommend having a single partition on the drive. 'Stored in reserved extra space' should be selected by default. If it isn't, select it and use the slider to adjust the size of your persistent file. 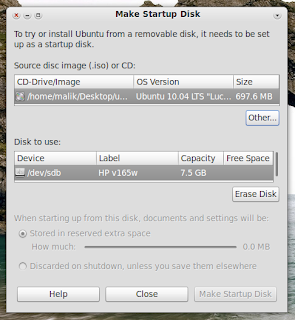 When satisfied with the settings, click at the 'Make Startup Disk' button. When finished, safely remove your drive and now you can use it for booting/installing/carrying your files and settings between PCs.